Hit the seven seas in search of some huge treasure troves with Wild Jane arcade slot machines, as you go in search of the bounty. Girl power is the theme of this game and there are some fantastic bonus features to enjoy! So get started and have fun playing and winning at SlotsBaby! Extra wins can be made with fun bonus features such as expanding wilds and a 2500x multiplier and a jackpot of up to 12500 coins! This 5-reel 20 pay line new online slot games has lots to keep you entertained for hours on end, so do you have what it takes to get your hands on the treasure? Leander Games are a Buenos Aires, Argentina based software development company who have a mission to provide the most enjoyable and innovative slot games for online casinos. They were founded back in 2009 and provide games in 26 different languages and currencies. While they are not yet as popular as iGaming giants such as NetEnt or Eyecon, but their portfolio of games is expanding constantly and gaining more notoriety with each release. Their games are all optimised to be played across all popular tablet, smart phone, laptop and desktop devices so their games can be enjoyed anywhere. Take part in this swashbuckling pirate adventure for as little as 20p per spin or up to £80 per spin on all of your favourite smartphone, tablet, laptop or desktop devices! 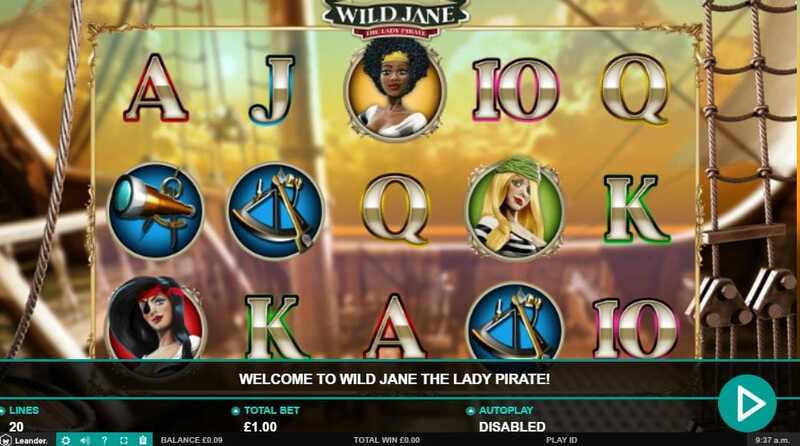 This pirate themed slot has reels that are set against the background of a classic pirate ship, and there are a range of symbols which differ in value, starting with the lower value playing cards, and the higher vaue ones include a sextant, telescope, and the members of the all-female pirate crew. Keep an eye out for the pirate with the eye patch as it is worth 2500 coins when you land 5 of them on a pay line! The Wild symbol is Skipper Jane herself she acts as a substitute for all other symbols on the reels apart from the Scatter and the Bonus. When she lands on the reels, she will expand to make the whole reel Wild as well! Shoot the Tankard Pick Me: match a pair of the symbols bonus feature on reels 2, 3 and 4 on one single spin and it will activate the pick me round. This will then open up a new window and you'll be presented with a selection of tankards to choose from. Pick 6 of them and Jane will shoot them to reveal a cash prize! Another window will then open up and you will have the chance to get more free spins and multipliers. Watch out for the bombs as they can end the feature early and you'll lose the chance to win more! When the free spins begin, there will be a stacked wild locked in place on reel 1 for the whole feature as well as the multiplier earned in the feature. Fall in love with this online Slot? Well, you can play more just like it, take a spin on Monkey Madness.